The College of Islamic Studies (CIS) at Hamad Bin Khalifa University (HBKU) organized the first Makerspace initiative in Qatar recently, and I participated in the life-enriching and fantastic programme. This report presents what took place at the wonderful event, the benefits of such an innovative initiative and its prospects for the world. My team and I at the Green Institute have been facing, the usual challenges faced by innovators and pacesetters in breaking new grounds of knowledge or bringing new and novel ideas into an environment that is vastly used to stereotypes. The questions people usually ask include “What is green education? How is it different? What can it do for me?” However, HBKU’s Makerspace initiative is a quintessence of the benefits of green education, and I know that writing and presenting this report as a speaker, will give the readers a fascinating view of some the benefits and prospects of green education in the world today. The events took place at the Education City, Student Center, Hamad Bin Khalifa University (HBKU) in Qatar for one week. Below are snapshots of the events. The HBKU’s Makerspace Initiative was organized by an Assistant Professor in the College of Islamic Studies, Dr. Mohammed Evren Tok. 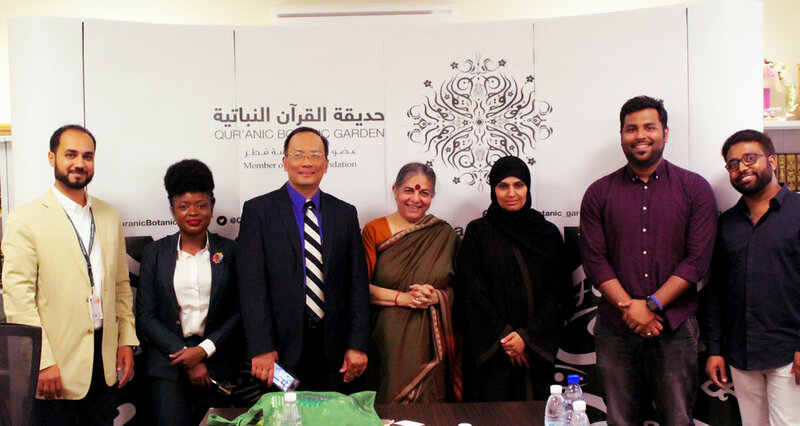 It was a collaborative space where the public could explore and learn about ‘Green Economy, Business and Entrepreneurship in Qatar’ and the world at large. It involved, inter alia, exhibitions, workshops, and short talks. The facilitators are leading and accomplished scholars and academics who were drawn from reputable tertiary institutions and organizations across the globe, on the recommendation of some international and distinguished academics and authorities and based on the works the former are known to have done or been doing in respect of the focus of the Makerspace Initiative. Thus, I was invited as a Young Green leader and the Founder of the Green Institute in Ondo state, Nigeria. Recycling Ring: This entailed members of the public bringing materials such as plastic, bags, paper, plastic bottles and caps, and textiles that were recycled during the events. Living off the Land Exhibition: This showcased how people rely on nature for a sustainable living either out of choice or as necessity demands, with the hope of creating an awareness of and inspiring the possibilities of sustainable lifestyles. Theatre: This involved giving of short talks by selected local and international speakers on their insights into environmentally sustainable initiatives in Qatar and worldwide. Panel 1 members discussed the Frameworks for environmentally sustainable lifestyles in Qatar and the World at large; members of Panel 2 highlighted its Ethics and Panel 3 members (where I belonged) gave insights into prospects. Production Zone: This included workshops for the education of future generation about possibilities in recycling and upcycling and visitors to the workshops witnessed how waste materials collected at the events were repurposed into art and clothes. Makeathon: This was a four-day design competition in which the participants were grouped into five teams and provided with fabrication tools and mentorship from Ibtechar (such as microcontrolling kits, 3D printers and CNC routers.) and also other resources found at the events. Experiential Zone: This comprised Botanical Garden, Greenhouse, Entrepreneurial Exhibitions, and local startups and businesses in Qatar demonstrated practices of sustainable farming, recycling of electronic and waste management. Of course, the whole programme was not about work only. For leisure, during the events, Ms. Fatima Al-Khalifa, the Director of Qur’anic Botanical Garden of Qatar received Dr. Joel Guello, Professor of Biological Systems Engineering in the University of Arizona, USA and myself at the Qur’anic Botanical Garden. We enjoyed the goodness and beauty of nature while discussing future collaborations. We also visited and explored the provisions of the Desert of Qatar, the Museum of Islamic Art, the Pearl (which is an old market with traditional buildings in Qatar), Katara Beach and of course, the Mall of Qatar which is known as Souq Waqif. The experiences we had by visiting these masterpieces of nature were fascinating, elevating and long-lasting. In fact, by the end of the programme, members of the public in Qatar and all international visitors were utterly convinced of the limitless opportunities in and benefits of green education. Are you green yet? ADENIKE AKINSEMOLU writes from Ondo, Nigeria.